Dustin Poirier felt he was on his way to winning his first bout against Eddie Alvarez at UFC 211 until it ended in a no-contest because of an illegal knee by Alvarez. He left no doubt this time around, stopping Alvarez by TKO at 4:05 of the second round Saturday in the main event of UFC on Fox 30. Poirier (24-5, one no-contest) controlled the first round by utilizing the jab to keep Alvarez at distance. Alvarez came out aggressively to begin the second, attacking Poirier with punches and trying for a takedown, but Poirier secured a guillotine choke, which Alvarez escaped. Alvarez went for another takedown and Poirier locked in another guillotine. Alvarez slipped out and gained top position but couldn’t do much with it. The momentum of the fight changed when Alvarez had Poirier in the mount position with Poirier’s back against the fence and nowhere to go. Alvarez threw an illegal 12-6 elbow; referee Marc Goddard broke up the fighters and stood them up. They then started trading shots, with Poirier getting the better of the exchange. He rocked Alvarez with a thunderous knee followed by heavy shots. Alvarez tried to throw a couple desperation shots, but Poirier kept coming, dropping Alvarez with a series of strikes. Goddard had seen enough and put a halt to the action. Poirier is unbeaten his last five fights. A win over the former titleholder puts the 29-year-old in prime position to fight champion Khabib Nurmagomedov if he doesn’t take on Conor McGregor next. Alvarez (29-6, one no-contest) goes into free agency 1-1 and one no-contest in his last three fights. Sporting News had live coverage of what happened in Calgary, Alberta, at UFC on Fox 30 (all times Eastern.). 10:03 p.m.: Round 1 to Poirier, 10-9. Alvarez and Poirier showed a lot of patience and composure in the opening round. They have to do that since they are scheduled to go 25 minutes this time and don’t want to wear themselves out so quickly. Poirier controlled the round by keeping Alvarez at bay with the jab. Alvarez needs to find a way to get on the inside or it will be a long night for him. 9:50 p.m.: It is now time for the main event of UFC on Fox 30, a lightweight bout between former champion and No. 3-ranked Eddie Alvarez and No. 4-ranked Dustin Poirier. They fought to a controversial no-contest at UFC 211 in May 2017, when Alvarez landed a knee to Poirier’s head while the latter’s hands were on the mat. Since then, Alvarez has beaten Justin Gaethje and Poirier has stopped Anthony Pettis and Gaethje. Each guy feels he is the superior fighter. We are about to find out who’s right. 9:46 p.m.: I get why the UFC and Fox do this, but I’m not a fan of going to back to the pregame team. Yes, they are breaking down the main event for the casual fan, but why not keep the flow of the show going? 9:38 p.m.: Aldo def. Stephens by TKO at 4:19 of the first round. What a comeback for Aldo. Stephens rocked Aldo with a series of punches and it looked to be mere moments before Stephens was going to send Aldo packing and his career in serious question. While most fighters would try for a takedown, Aldo went toe-to-toe and kept coming right at Stephens. Aldo connected on a jab followed by a vicious body shot, which made Stephens wince in serious pain to the mat. Aldo seized the opportunity, landing punch after punch and with Stephens not intelligently defending himself, the referee stopped the fight. Give Aldo all the credit in the world. He could have packed it in and let Stephens finish him off. Instead, we seen the heart of a champion and why he is the best featherweight we have ever seen. The win snaps a two-fight losing streak for the Brazilian. 9:22 p.m.: Coming up in the co-main event of UFC on Fox 30, in featherweight action, former champion and No. 2-ranked Jose Aldo squares off against No. 4-ranked Jeremy Stephens. Very big here for Aldo. He’s lost back-to-back fights to current champ Max Hollway and three of last four overall. A loss and it could be the end for the greatest fighter to ever compete at 145 pounds. Stephens comes in on the biggest run of his career, winning three consecutive bouts, two of them by stoppage. Can Stephens win the big one? Or does Aldo show he has more in the tank? 9:17 p.m.: Jedrzejczyk def. Torres by unanimous decision (30-27, 30-27, 30-27). I couldn’t have been more wrong about how the judges would score the fight. I expected the scorecards to be tighter than they were. Jedrzejcyzk showed she could fight anywhere. Whether it was in the clinch or on the feet with her striking, the native of Poland showed her all-around game. It was a great way for her to get back into the winner’s circle after losing back-to-back fights. Getting another title shot is unlikely at this point, though one more win and “Joanna Champion” should get one more crack at the belt she believes is hers. 9:10 p.m.: Very intrigued about how this is going to be scored. Could see it going either way. 9:03 p.m.: Great end to the second round as Jedrzejczyk and Torres let their hands go. Torres got the better of the exchanges and made Jedrzejczyk grab her so more damage couldn’t be inflicted. Let’s see if Torres continues to strike at the beginning of the final round. Could be onto something. 8:57 p.m.: Battle of clinch work in the first round. Jedrzejczyk had the advantage there because she connected on more strikes, but I liked Torres’ strategy. Keeping her body against Jedrzejczyk will wear down the former champ as the fight goes on. 8:47 p.m.: Up next at UFC on Fox 30: Former champion and No. 1-ranked Joanna Jedrzejczyk faces off against No. 5-ranked Tecia Torres in women’s strawweight action. Jedrzejczyk is in a must-win situation. She has lost back-to-back fights to current champ Rose Namajunas. A third straight loss and she’ll move down in the pecking order at 115 pounds. This is the biggest fight of Torres’ career. Beating the former titleholder would solidify her as the top contender in the weight class. High-stakes fighting at its finest. Who will separate herself from the pack? 8:38 p.m.: Hernandez def. Aubin-Mercier by unanimous decision (30-27, 29-28, 29-28). Great work by Hernandez, though. He used his striking to help set up his takedowns and frustrate Aubin-Mercier. A great way to start one’s UFC career, winning back-to-back-fights over two solid fighters in a deep lightweight division. Hard to see where the judges can give a round to Aubin-Mercier considering he gave away the second by pulling guard and letting Hernandez take control. Hernandez wants to face someone ranked between sixth and 10th for his next fight, but definitely someone in the top 10. Some advice: Keep growing your game before jumping into the ocean against the sharks in the best division of the UFC. 8:34 p.m.: The Decision should go to Hernandez. Off to the judges’ scorecards we go. 8:25 p.m.: Why did Aubin-Mercier pull guard when he was controlling the second round? Horrible strategy. He just let Hernandez get back into the round. 8:21 p.m.: Really good first round for Hernandez. Constant pressure throughout kept Aubin-Mercier off his game and a smart, late takedown at the end of the round helped calm the 25-year-old and not expend too much energy. 8:18 p.m.: Not a fan of seeing a preview for a movie at the bottom right of my television while two guys are punching each other. 8:10 p.m.: Opening the main card of UFC on Fox 30: In lightweight action, No. 13-ranked Alexander Hernandez takes on Olivier Aubin-Mercier. Hernandez took the MMA world by storm when he stepped up on short notice and knocked out previously ranked Beniel Dariush in 42 seconds. Aubin-Mercier is on a tear, reeling off four consecutive victories, three of them via stoppage. Can Aubin-Mercier derail the hype train surrounding Hernandez? A very intriguing fight between two young lions at 155 pounds. 8 p.m.: The UFC on Fox 30 main card is about to begin. The show begins by paying respect to the people who were killed recently in a mass shooting in Toronto. Great way to start. 6:10 p.m.: We are less than two hours away from the action. You could feel the intensity between Alvarez and Poirier during the final staredown at Friday’s ceremonial weigh-ins. 1:30 p.m.: As we inch closer to the main card of UFC on Fox 30, let’s take a look back at Alvarez capturing the lightweight belt from Rafael dos Anjos. 11:30 a.m.: Eddie Alvarez and Dustin Poirier will settle their score this evening at UFC on Fox 30. Who will emerge victorious and reign supreme? 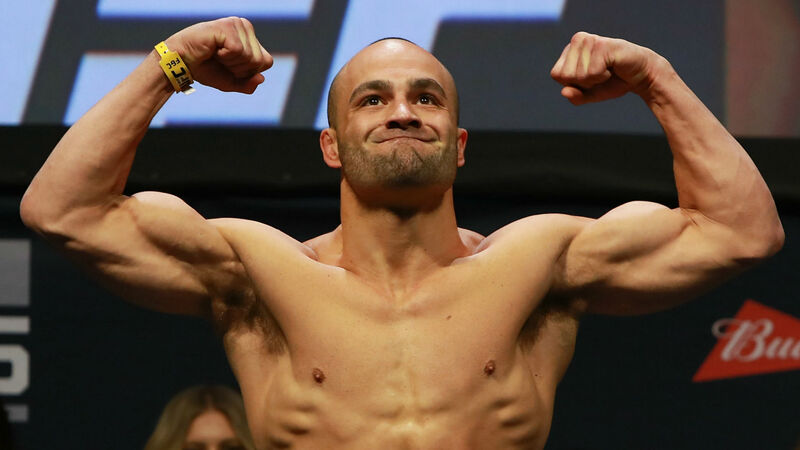 SN will provide coverage throughout the day until the main card begins at 8 p.m.
—​ Eddie Alvarez tells SN he’s betting on himself by taking the rematch against Dustin Poirier. — Poirier explains to SN why he didn’t think Alvarez would accept this fight. — Jeremy Stephens wants to do one thing. He tells SN what it is.